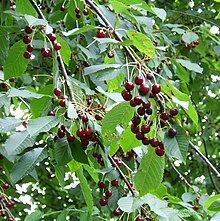 Prunus avium, commonly cried gean, is a species o cherry, a flouerin plant in the rose faimily Rosaceae. It is native tae Europe, Anatolie, Maghreb, an wastren Asie, frae the Breetish Isles sooth tae Morocco an Tunisie, north tae the Trondheimsfjord region in Norawa an east tae the Caucasus an northren Iran, wi a smaw isolatit population in the wastren Himalaya. The species is widely cultivatit in ither regions an haes acome naituralised in North Americae an Australie. ↑ "The Plant List: A Working List of All Plant Species". Retrieved 27 January 2014. ↑ Atlas of Living Australia. "Prunus avium : Sweet Cherry – Atlas of Living Australia". ala.org.au. This page wis last eeditit on 3 Apryle 2017, at 22:12.